Printed circuit board manufacturers and other facets of aerospace technology are coming together to revolutionize the industry. There are five technologies in particular that are taking the aerospace field by storm to help with everything from component design to how batteries pull oxygen to create energy. The Internet of things: The IoT helps transform day-to-day tasks in the aviation sector, from assembly to manufacturing to maintenance. 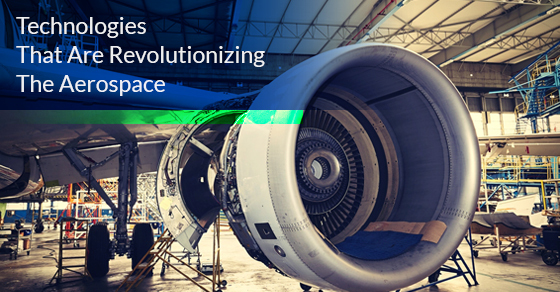 By involving the IoT in the aerospace industry, companies can manage several connected devices from one interface. This helps streamline safety and can track an aircraft’s location more accurately. Cloud computing: The cloud has proven beneficial in other industries, so it’s no wonder that aerospace is looking to cloud computing to revolutionize air travel and data storage. The cloud also plays a role in the Internet of things, specially the collection and use of data to make improvements on all elements involved in the design of flight crafts and equipment. Advanced FBW systems: Fly-by-wire (FBW) systems are computer-configured controls used to manage unstable aircrafts. Advanced FBW systems help reduce testing time, curb maintenance costs, trim the manual efforts needed by the pilot and streamline safety checks performed pre-flight with automated test equipment. Li-air batteries: Lithium-air (li-air) batteries pull oxygen in so that it can react with the lithium ions as they expel their energy. While the battery charges, the oxygen is also expelled, leading to the decomposition of the electrolytes that are used in ordinary batteries. This means that li-air batteries are unusable after a few charging cycles; however, researchers are currently working to fix this glitch so that li-air batteries become stronger and more commonplace in the industry. 3D printing: Aerospace giant NASA has come up with an strategy to increase fuel efficiency by improving the power density of electric motor designs. In order to do so, they are turning to 3D printers to create electric motor parts that are lighter, smaller are possibly more efficient. 3D printing in the aerospace industry is slowly becoming the norm, but it may take a few years until printed circuit board manufacturers follow suit in the creation of all space travel products. The aerospace industry is shifting due to the aforementioned technological innovations. Once each is refined, we’ll see everyone involved in the industry, from printed circuit board manufacturers to data scientists, using this technology in their creation process.